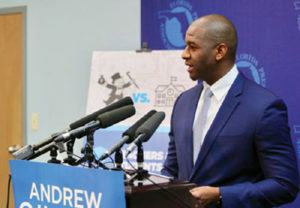 Recently, a coalition of eight local and national progressive organizations announced a collective commitment of resources in the final week of Tallahassee Mayor Andrew Gillum’s historic primary campaign for Governor, investing over three million dollars to reach over three million voters with their efforts. The coalition includes leading Florida grassroots groups Dream Defenders Action, FLIC Votes, New Florida Majority, The New Florida Vision PAC, and Organize Florida and national progressive organizations Center for Popular Democracy Action, The Collective PAC, Indivisible Action, NextGen America, Our Revolution, and People For the American Way. Through door-to-door canvasses, phone-banks, texting, mail, digital, radio and TV ads, these organizations are activating voters who may not have participated in past primary elections, including young voters, Black voters, Latino voters and the growing community of Puerto Rican voters. These organizations are working to elect Andrew Gillum by expanding the Florida primary electorate and talking to often-ignored Democrats in August. Through their comprehensive efforts, these organizations will not only elect Andrew Gillum as the Democratic nominee for Governor, but also help Florida Democrats win up and down the ballot in November by targeting low-propensity voters over two months before the general election. Gillum’s years of public service and unapologetically progressive platform earned him the support of the coalition as he runs to become Florida’s first Black and youngest Governor in a Democratic field of otherwise extremely wealthy candidates.